Still sick, but I’m finally recovering. I have barely left the house in the last five days and I’m getting restless. I had every intention of going to work this morning, but then I woke up still exhausted even after a full night’s sleep, and with a lovely hacking cough that sounded disgusting. I couldn’t see myself being around my co-workers with a cough like that so I stayed home instead. I’m getting pretty sick of this routine, though, which is how I know I’m almost over this illness. Not only do I need to get back to work tomorrow, but I also need to get back to exercising. At this point I’m going to have a tough time getting back to the shape I was in when I ran my marathon, but at least I can get started. I have way too many races coming up this spring I need to be ready for. That includes the Pasadena Half Marathon on Sunday morning which is going to be difficult at best after being sidelined for so long due to this cold/flu. And it might be raining too so that won’t make it any easier. I’m really looking forward to getting back on my feet, though. Plus, I still have a weight loss goal that I want to meet in the near future. My diet while stuck at home has been less than optimal for progress on that front. Getting back to normal can’t happen soon enough. Once again I’m splitting my day between my bed and couch due to this lovely cold/flu combo, but luckily I’m starting to feel better. As I’m sitting at home recovering I’m having trouble not being active, especially after my rigorous training regimen of the last four months or so. But then I remember that going to CVS this morning to pick up a few things completely exhausted me and I realize that I’m still too sick to exercise. So instead of physically exerting myself any more than necessary in my current state I’ll reflect on my physical exertions of 2016 instead! According to my spreadsheet I finished up 2016 running 1092 miles. Holy cow! 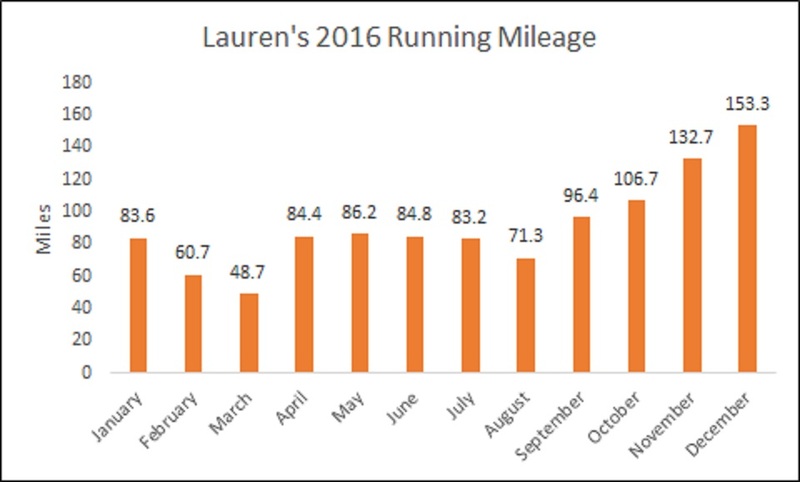 I originally started the spreadsheet to keep track of the insane number of races that I register for, but at the beginning of 2016 I decided to also maintain a tally of my yearly miles just for fun. Looking at the graph I made at the end of the year it’s easy to see where I was injured (February and March), and it’s easy to see where I was marathon training (September through December). The rest of the year was surprisingly consistent, which I’m happy about because that isn’t easy to do when the summer heat is at its worst. I’m pretty proud of how consistent I was with my running for most of the year, especially for not missing any scheduled runs during marathon training. I was really lucky to not contract any serious illnesses during that timeframe! (Being sick this week has made me a little nuts. I feel like a lazy slob for not running at all over the last three days, but even walking up and down my stairs at home is more than I can handle right now.) 2016 was an incredibly successful year for me running-wise, and I hope I can follow that with an even more rewarding 2017. And with one marathon behind me I’m already on the right track! I have a whole bunch of races coming up this spring so I should have a lot of stories to tell in the near future. Let’s just hope I can lace up my running shoes again soon because all this lying around doing nothing is making me crazy! I have a confession to make. January is just about halfway over and my house is still fully decorated for Christmas. I justified leaving my Christmas tree up until after I got back from Orlando due to the fact that I didn’t finish putting it up until December 18th. I figured this weekend I would put on a movie, take down all of the holiday decor, and put it away for another year. But then I got sick. After a couple of days of denial I realized I had a cold on Thursday. The symptoms were pretty mild at that point so I hoped I would avoid a serious illness. Unfortunately I wasn’t that lucky. When I ran the Star Wars 5K at Disneyland on Friday morning my lungs were burning during the race, but it didn’t seems to negatively impact my performance. More on that in another post. However, by the time I left work that afternoon I knew I was deteriorating. Yesterday my cold symptoms were in full swing so I spent all day either in bed or on the couch watching TV, dosing myself with DayQuil and NyQuil. So much for the productive weekend I’d planned on. And then instead of the hoped for overnight improvement I actually felt worse when I woke up this morning. Unfortunately I had flu symptoms. My diagnosis was confirmed at the CVS Minute Clinic where I got a prescription for Tamiflu from the doctor. Fantastic. Another day of zero productivity. So my Christmas tree is going to stay up for a little longer, it seems. Being sick does have one tiny upside, though. It’s forced me to rest which has been helpful at healing a running-based injury. During the marathon last Sunday I hurt my right foot. It didn’t bother while I was running for five and a half hours, but it was pretty painful afterwards. 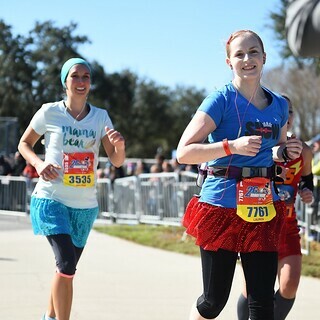 I was having some problems with my knee during the race and I think I subconsciously adjusted my gait to try and protect it. That is probably how I hurt my foot. 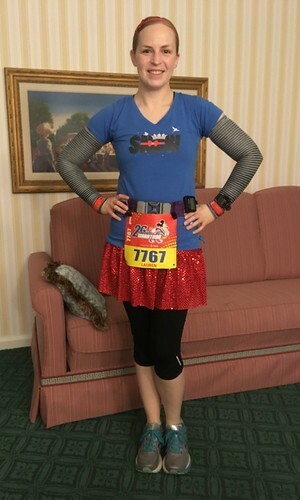 I did a lot of walking around Disney World the three days after the race even with the pain because nothing was going to keep me from park time while I was in Orlando. To be cautious I went to see my podiatrist the day after I returned to Los Angeles and he told me my foot was probably in a pre-stress fracture state. He likened it to a hanger that’s been bent several times so that the metal is hot, but not yet broken. Fun, huh? My instructions were to take it easy for a week or so to prevent a fracture from happening in my bone’s current weakened state. Funny enough, I didn’t have any foot pain after I got back from Orlando so I figured I was on the mend. Being a rebel, I wasn’t really intending to follow my doctor’s instructions. Case in point, running the Star Wars 5K the morning after my podiatrist appointment was probably not the best idea, but luckily my foot felt perfectly fine over those 3.1 miles. After that positive outing I thought I’d be able to resume my workout regimen over the weekend, but then I was struck down by illness. This cold/flu has brought on a period of forced rest over the last two days, and that will continue at least through tomorrow while the Tamiflu hopefully takes effect. Fingers crossed that I feel better tomorrow! I’m spending the weekend sick at home with a wicked cold, which always seems to happen when I get back from vacation. With all this time spent on my couch in front of the TV I figured I’d have plenty of time to write some decent blog posts, but my brain isn’t cooperating. I can barely breathe, I have a lovely cough, and I’m reaching for my Rogue One Kleenex box pretty often. Doesn’t that sound like fun? So instead of working on my marathon recap post(s) I am writing about something silly instead. Silly is about all I can handle in my current state! I used some of my down time over the holidays to clean out my closets, my dresser, and all of my storage boxes, and in the process I assembled a huge pile of clothes to donate. I seriously filled up the entire backseat of my car with bags. The discarded clothing was a mix of items that I haven’t worn in ages, items I don’t really like (i.e., ugly race shirts), and items that no longer fit since I’ve lost weight. It was a relief to drop off all of that stuff at Goodwill earlier this month, and also to have some free space in my closets and drawers that used to be filled to the brim. Even after reducing my wardrobe by getting rid of all that I still can’t believe how much I own. Which is why my acquisition of six new shirts (not including my Disney World marathon shirt which was included in my race registration) over the last week or so is pretty ridiculous. 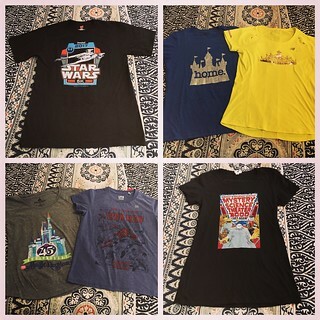 First of all, I picked up two of these shirts on my trip to Disney World (see bottom left of the above photo) – a Magic Kingdom 45th anniversary shirt and an Iron Man shirt from the Uniqlo store at Disney Springs. (If you’re a Disney fan and haven’t seen their line of shirts at Uniqlo yet you are missing out!) Next, I discovered that a package containing my Mystery Science Theater 3000 revival shirt (bottom right) arrived while I was in Orlando. I contributed to the Bring Back MST3K Kickstarter over Thanksgiving in 2014 so I guess it’s about time! Then I went to the Star Wars Half Marathon Weekend expo on Thursday at the Disneyland Hotel and rounded out my new collection. Not only did I get the Star Wars 5K shirt that came with mt registration (top left), but I bought two shirts from New Balance that struck my fancy (top right). I feel pretty ridiculous to acquire all of these shortly after donating so much to Goodwill, but it seems I have no restraint when it comes to graphic t-shirts. At least I’ve got my weekend outfits covered for a while! My first full day back in LA after the Disney World Marathon has been a little crazy, but I will start writing some recap posts from my trip to Orlando soon. The above photo was taken around 3 AM on Sunday morning just before I departed the hotel for the marathon start line. Don’t I look happy? I was blissfully unaware of exactly how cold it was outside in the pre-dawn hours (temperature was in the 30s with the wind chill even lower), and also how difficult running those 26.2 miles was going to be. But just so you know (especially if you’re not friends with me on Facebook where I’ve posted a few other pictures), I did successfully complete the marathon! It was an amazing trip to Disney World and I promise to tell you all about it in the upcoming days. But tonight I have to go to sleep a little early because I will be headed to the Star Wars 5K at Disneyland in the morning! As of right now my marathon training is complete! I ran my last few miles tonight in the chilly wind that usually follows a Southern California rain storm. (Our winter weather has been more typical so far this season with a good deal of rain. It’s a good thing too because we need it!) 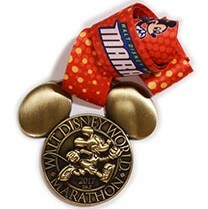 The next time I lace up my shoes will be for the Walt Disney World Marathon on Sunday. I’m nervous and excited at the same time! I know I’m as ready as I can be to successfully finish 26.2 miles, but I’ve never actually run that far before so at this point that’s my only reservation. I’m confident that I’ll be able to cross the finish line under my own power, though. I can’t wait to earn that medal! Tomorrow morning I’m flying to Orlando and my bags are just about ready to go. 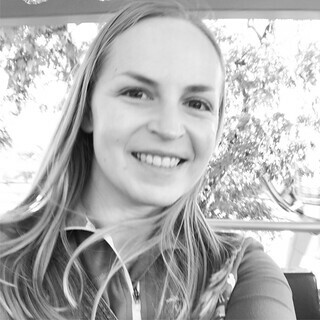 I packed all of the essential items days ago to make sure that the most important articles of clothing (i.e., my carefully chosen marathon outfit) didn’t end up dirty at an inopportune time. However, I need to rethink my wardrobe for the rest of the trip since there is a cold front coming through central Florida on Saturday. It’s going to be a lot colder than I expected! That means absolutely perfect running weather on Sunday, but my selected t-shirts for Disney World park time might not be warm enough. That’s what hoodies are for! I can’t believe the marathon is almost here. It’s been nine months since I registered and four months since I started training, and now I’m less than three days away from the race. Fingers crossed that this trip has a positive outcome! I’m starting this year off with an easy resolution. Relative to some of my past ones, that is. 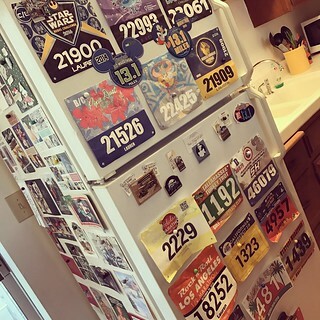 I’ve been accumulating medals and bibs from races since the spring of 2014 and I’ve never really figured out what to do with them in the long term. Race medals from the current calendar year get hung up on the wall of my cubicle at work, which slowly but surely adds a garish amount of sparkle to my workspace over the course of twelve months. But then every January the previous year’s accolades come home and get stashed away in a box under my bed. In the beginning I had every intention of hanging all of these hard-earned medals on the wall in my bedroom, but over time I realized that I didn’t really want to. It’s not that I don’t enjoy receiving the medals as recognition of my accomplishments, but I don’t have the drive to display them anywhere afterwards. Over the holidays I sorted through the box of my old race medals from 2014 and 2015 and decided that most of them weren’t worth keeping. There’s a charity called Medals 4 Mettle that gives donated medals to sick children so I think I’ll send a portion of my collection there. Hopefully I can get that done soon. As far as race bibs go, I have a huge stack of them in the same box as the old medals. The most recent ones get displayed on the front of my refrigerator, as you can see in the above photo (Disney ones get top billing), but after their tenure there is over they are filed away. Some of the bibs are so nondescript that I probably should have just tossed them, but others are lovely souvenirs from of races that I’ve loved (and others I’ve hated). Luckily race bibs are small, thin, and light so I think I’ll keep them as a reminder of my progress over the last few years. My goal for 2017 is to put all of them (OK, maybe not the ones that I can’t even remember what race they’re from) in a scrapbook or album for future reference. Neither of these goals is too difficult, right? Now if I can just follow through before the year is over! I am now the reluctant owner of a new iPhone 7. This is not how I expected this day to go. I left work a little early on my first day back after the holidays to try and restore my ailing iPhone 6. I had an appointment at Best Buy to hopefully get the battery replaced, but it was a short visit because the Geek Squad told me they weren’t authorized to do that. Since none of the local Apple stores had any appointments available before I have to leave for Orlando I saw my chance to have a reliable cell phone on my trip slipping away. So in an act of desperation I got in my car and headed to the South Coast Plaza location to beg for help from any employee that would listen. By the time I got there even the store’s walk in queue was closed for the day because they were so busy. I was at the end of my rope. I almost started crying while talking to a manager. At this point I made a desperate decision to solve the problem by throwing money at it. Hence the iPhone 7. I hadn’t planned on making for such an extravagant purchase today, but it was the fastest and easiest way to have a fully functional cell phone before Friday. A half hour later I walked out of the Apple Store with a brand new phone that will hopefully last me for a few years. It’s not that I won’t get my money’s worth out of the iPhone 7, but it’s disappointing that I had to go to such lengths just because the new operating system didn’t play nicely with my old iPhone 6 battery. The upside is that I have the latest and greatest technology, including an upgraded camera, to play with while I’m at Disney World. Happy early birthday to me! Adding to my unexpected day I skipped boot camp this evening. It took me 45 minutes to get home from South Coast Plaza in rush hour traffic which barely gave me enough time to get ready and make it to boot camp by 7 PM. I quickly checked my Facebook messages as soon as I walked in the door to find out that my workout buddy was wavering on going to the gym. That was excuse enough for me to suggest that we go to tomorrow’s class instead. The last thing I needed today was more stress. Suddenly I had no plans for the night and no desire to go running again after three straight days and 18 miles. I hardly knew what to do with an unplanned rest day! Luckily I had more than enough chores to keep me occupied. And even with all of the extra free time I had from skipping boot camp I’ve stay up too late writing this post. I have a feeling I’m not going to get a lot of sleep before I leave for Orlando on Friday. No more rest days until then! Today was the last day of my holiday break which means that I have to go back to work tomorrow. I’m not crazy about that prospect, but I’ve had a paid vacation since December 23rd so I can’t really complain. If I didn’t accomplish as much as I wanted to that’s my own fault. Today didn’t really help me feel like my time off was well spent either. Unfortunately I spent most of the day trying to figure out what’s wrong with my stupid iPhone. A couple of days ago I noticed that the battery was draining very rapidly (losing 50% in about 15 minutes) even with very light phone usage. At first I thought it was due to my new Garmin watch that was connected via Bluetooth or some of the new running apps I added recently. However, reverting those changes didn’t fix the problem. I won’t bore you with the details, but as of this afternoon I’ve tried everything in my power to resolve the issue, including completely wiping the phone and restoring the factory settings. This is particularly because I need a reliable phone for my marathon and I’m leaving for Orlando on Friday morning. I have an appointment at Best Buy tomorrow to perhaps replace the battery. From what I’ve read in Apple forums this was the only thing that seemed to help at all, even though my battery passed a diagnostic test at a local repair shop. If my poor phone is still afflicted after that I’ll have to walk in to an Apple Store on Wednesday without an appointment and hope they have a solution. Let’s just hope the “solution” isn’t simply a brand new phone. I’m not really ready for that yet, but I may not have much of a choice. Kinda like my car buying experience last spring! I’ll let you know how it goes. There was some good news today – Florida beat Iowa in the Outback Bowl! Go Gators! It was a lot of fun to watch them win a game after the disappointing end to the regular season. Let’s hope that this portends a promising 2017 season for Florida. I guess we’ll have to wait until the fall to find out. Right now I need to go to bed so I can get up on time for work tomorrow morning. My holiday break ended with a bit of a whimper, but I still had a relaxing and fairly productive week and a half. Now it’s time to put the holidays behind me and get started on 2017. My Christmas tree won’t come down until after I get home from Orlando, though. I didn’t put it up until December 18th this year so I’m going to enjoy it for a little longer. Happy January everyone!